Hi, I’m Onyxx! I was very neglected at my former home but could be a great addition to yours! low-maintenance, mellow, and affectionate guy who’s happy with a short stroll around the neighborhood a few times a week, as long as I can snuggle in your lap afterward. Truth be told, I am kind of a couch potato and love to eat, so you’ll have to help me keep my waistline in check! 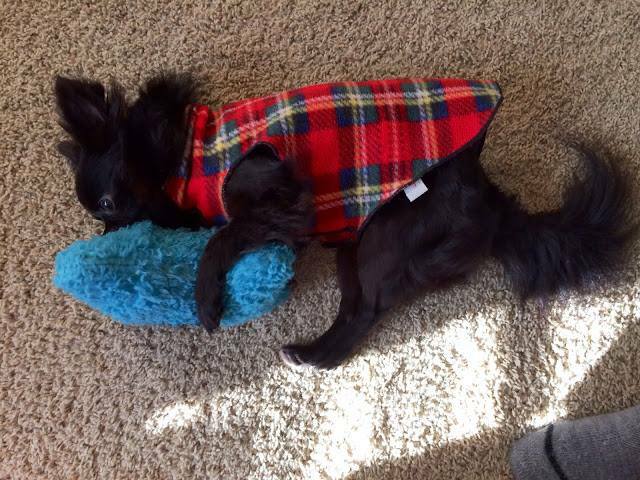 I love to play tug, wrestle with other small dogs, or just sit with you while you work or watch TV. I know many tricks and would love to show them to you and if you have enough treats, I’ll learn anything! My soft shiny mane comes naturally, without much grooming and I barely shed but will require regular flea treatments. I would be a great apartment dog, though I get anxious when I’m home alone. Small kids make me nervous but I would love another small dog to play with! If you would like to meet me, contact Indigo Rescue at 503-636-7222, IndigoRescue.org, and bring some treats! February 12, 2014 by Spot Magazine.